Spray 6-quart slow cooker with cooking spray. Heat 10-inch skillet over medium heat. Drizzle with olive oil, and add sausage. Cook about 7 minutes, stirring occasionally, until sausage lightly browns; spoon into slow cooker. In same skillet, add onion, bell pepper and celery. Cook until crisp-tender, stirring occasionally; add to slow cooker. In same skillet, add chopped chicken. Cook until no longer pink, stirring occasionally; add to slow cooker. Add okra to slow cooker. In heavy or cast-iron skillet, heat vegetable oil over medium-low heat. Using whisk, beat in flour; add Cajun seasoning and thyme. Continue to beat and cook 15 to 20 minutes, making roux that is brown and smells very nutty. Add beef stock, and beat well with whisk. Heat to boiling, beating constantly. Cook until thickened; add to slow cooker. Add diced tomatoes to slow cooker; stir well. Cover; cook on Low heat setting 6 hours. 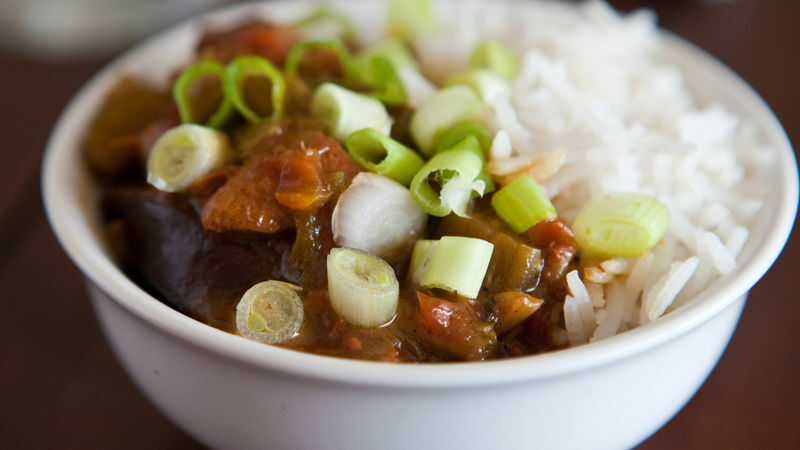 Serve gumbo with rice. Garnish with green onions before serving. If you can find it, sprinkle file, pronounced (fee-lay), on gumbo just before serving. It’s an authentic Cajun seasoning made from sassafras leaves. Be careful not to add it before the last minute, though; it can become a stringy mess if it boils in the gumbo.